O God, from whom all good things come, grant that we, who call on you in our need, may at your prompting discern what is right, and by your guidance do it. Through our Lord Jesus Christ, your Son, who lives and reigns with you in the unity of the Holy Spirit, one God, for ever and ever. for ever and ever. According to the 1962 Missal of St. John XXIII the Extraordinary Form of the Roman Rite, today is the feast of St. John of San Facondo born in 1430 in Spain. He was a canon of the cathedral of Burgos and then entered the Hermits of St. Augustine. He was distinguished for his great devotion to the sacrifice of the Mass and for his forceful preaching. He died in 1479. 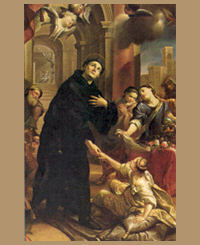 Today is also the commemoration of Sts. Basilides, Cyrinus, Nabor and Nazarius. These four martyrs have been venerated together at Rome from very early in the Church's history. John came from a wealthy family. During a serious sickness he vowed to embrace an ascetic way of life upon recovery. In fulfillment of his resolve, he gave the better of his two garments to a beggar who went about almost naked, and joined the hermits of St. Augustine at Salamanca (1463); at the time that monastery was universally respected because of its strict rule and discipline. He was often granted the privilege of seeing Christ the Lord at holy Mass and learning the deepest secrets directly from God Himself, the secrets of men's hearts and the secret events of the future. Through his prayers the seven-year-old daughter of his brother was raised to life. His death was probably due to poisoning. John's special charism was to calm passions and to restore peace. How quickly disputes and quarrels arise! Yet we must practice the beatitude: "Blessed are the peacemakers." Remember that the prayers for peace and the kiss of peace in the Mass should not be empty ceremonies. Symbols: A hermit of St. Augustine, walking upon the sea; holding a chalice and host surrounded by rays of light. Basilides was a soldier in Rome, Nabor and Nazarius soldiers in Milan. Their bodies were found on the present day by St. Ambrose. All three died as martyrs under Diocletian. Cyrinus or Quirinus was a famous bishop of Siscia. In the church of the Apostles in Milan, St. Ambrose inscribed a number of edifying verses over the tomb of St. Nazarius. The final lines are: "Whom the Cross leads to victory, for him the Cross is the pledge of peace."